64-year-old Native American Nathan Phillips said that he felt threatened by the teens and that they swarmed around him -chanted “build the wall” – as he and other activists were preparing to leave the march. Phillips then changed his story completely with the Detroit Free Press and CNN, in which he then admitted that HE approached the students, not the other way around. His interviews and the various videos of the incident paint a picture of him saying he is a) terrified of the Catholic students yet b) walking right up to and into their group; a) doing his best to leave yet b) pressing forward insistently; a) trying to go up the steps of the Lincoln Memorial yet b) however, there is a clear path up those steps approximately ten feet to his right. So why didn’t he just take that route? More evidence proves in a nearly two-hour video of the incident in which a group of about five black individuals from the Black Hebrew Israelites shout abuse at the kids and Trump supporters near the Lincoln Memorial. “You believe in a f***** child molester,” they shout. “The Purge is coming.” “Christ is coming back to kick your cracker asses.” Etc. One youth, apparently part of the Covington group, takes off his shirt, leads the group in what looks like a choreographed school cheer (this is consistent with the account one student provided to WKRC TV in Cincinnati), everyone joins in, then most of them sit down or take a knee at about the 1:12 mark. At that point Nathan Phillips emerges from the crowd banging his drum and walks up to the kids with his drum. The kids get up and start dancing and jumping again. Phillips then moves the drum even closer to Nick Sandmann’s face, so it’s just a few inches from his ears, and keeps banging away for several more minutes. 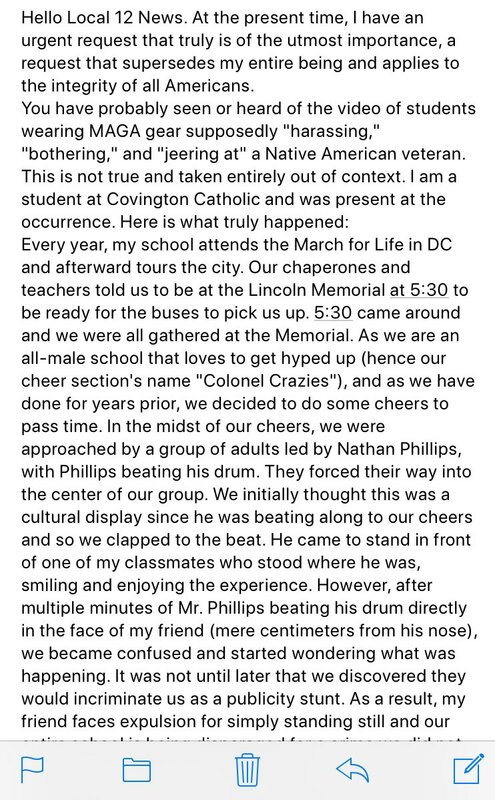 As countless videos show the Covington kids did not chant “build the wall,” much less “attack” black people as Phillips says. What videos do show is Phillps friend telling the kids to go back to Europe. The point is Phillips has fooled everyone into accepting his false version of what happened that day. And the media were all too happy to play along.